PanARMENIAN.Net - "Game of Thrones" fans are desperate to know how the series will end and more importantly, who will survive. However, is seems Arya Stark might not make it through to the end of the HBO series, Express says. Game of Thrones’ final ever season is nearing its air date on April 14. Most fans are desperate to know who will perish in the last episodes. However, it seems on favourite character might not survive after all. Arya Stark (played by Maisie Williams) is the latest name to top the suspected death list. It all spawned from a Reddit post about her connection to Jaqen H’ghar (Tom Wlaschiha) in season six. Velar7 wrote: “Season six, episode eight: I have seen this episode last night. These are all very valid questions, but it seems there’s a potentially horrific answer. Reddit commenter, OhItsStefan, theorised that the story isn’t over just yet. They suggested: “Personally, I don’t think they’ll let her go. “My thought is that in season eight we might see the consequences of her actions. The Faceless Men were certainly a ruthless bunch of assassins. They worship the Many-Faced God, who believe death is a merciful end to suffering. Arya trained under the Faceless Men, lead by Jaqen in season six and learned how to steal a face in order to deceptively murder someone. She has used her skills on multiple occasions - but will hit come back to bite her? This comes after Maisie Williams suggested the end of Game of Thrones would be an unhappy affair. She commented that viewers wouldn’t enjoy it because the show is ending and it will be a sad moment. Express. 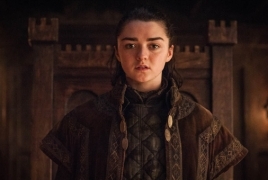 Game of Thrones season 8 spoilers: Arya Stark killed in brutal twist you DIDN’T expect?